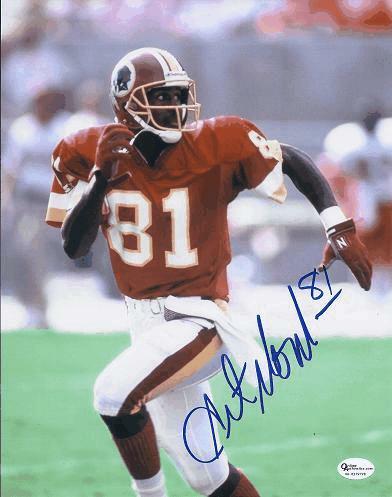 A wide receiving prodigy, Art Monk cards and autographed memorabilia are very collectible. He was the first player in NFL history to total more than 900 career receptions. He also holds, or was the first to achieve, many other receiving records. Primarily remembered as member of the Washington Redskins, Monk was a key part of the offense that won three Super Bowls during his tenure. 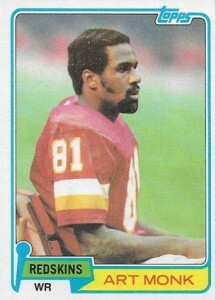 Monk's rookie card is part of the 1981 Topps Football set. He also has two food-issue cards from the same year. One is from Coke and the other from Frito Lay. 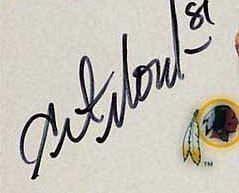 Art Monk's first certified autographed card is in the 1992 Pro Line Profiles set. He has a total of eight different autograph cards on the checklist, none of which are serial numbered. His first game-used memorabilia cards were included in multiple 2001 Donruss products. One of his most popular cards is his autographed memorabilia card in 2001 Donruss Throwback Threads. It is limited to 25 serial numbered copies. 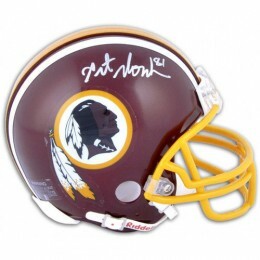 Art Monk autographed memorabilia remains popular, particularly with Washington Redskins fans and collectors. 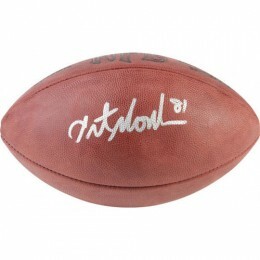 Footballs and photographs are the most commonly found items. The prices of his memorabilia saw an increase upon his induction into the Hall of Fame in 2008. Monk shares the rookie spotlight with fellow Hall of Famer Joe Montana in the set. The 1981 Topps Football set is known for having centering issues. As a result, professionally graded cards returning with a high grade sell at a premium. 1992 Pro Line Profiles Art Monk 9 Card Set Redskins RARE!!! L@@K!!! 1992 Pro Line Profiles Art Monk Autograph Certified Redskins RARE!!! L@@K!!! 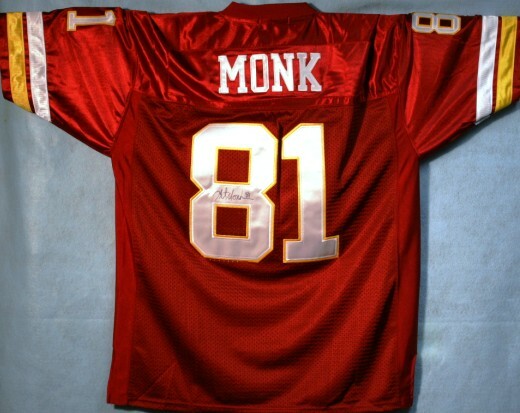 Below you will find an example of what Art Monk's authentic signature looks like. This can be used as a first point of reference for determining the legitimacy of autograph memorabilia, but is not a substitute for having your items authenticated by a well-respected professional autograph authentication company. Some of the trusted sources within the sports memorabilia market include the following companies: PSA, JSA, Tristar, and Mounted Memories. Click on any of the images below to view full size photos. The "A" consists of a short and longer intersecting line. They are connected by a line that makes a semi-circle. The "t" looks like a lower case cursive "l" with a horizontal line crossing it. The "M" is clearly legible. The "k," typically exhibits only one intersecting line and it is not usually connected to the vertical line. He inscribes his jersey number "81" frequently. I have a pristine Art Monk Milestone NFL pro set card # 22. The front of the card depicts him running, has his name, 800 receptions, with the official NFL Card, NFL emblem, with Pro set. On the back depicts a short history with the Red Skins, and also shows his season by season receiving from 1980 to 1991. Would you know the value of the card? 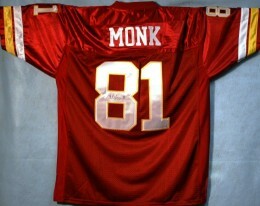 I HAVE AN AUTOGRAPHED ART MONK, 1982 CARD, 515. WANT TO SELL IT. WHAT’S THE VALUE?